You are currently browsing the tag archive for the ‘tomatoes’ tag. 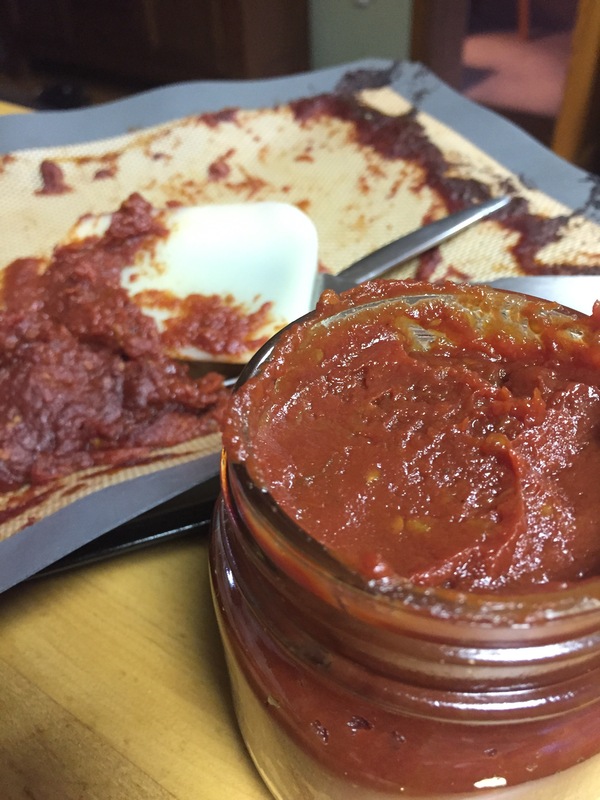 This weekend’s project (which really did take most of the weekend) was to make tomato paste. I never tackled this before but seemed like it was a worthwhile project to use the overabundance of ripe Roma tomatoes that had suddenly appeared in the basement. When they were predicting frost a few weeks back, I picked pretty much every single tomato that was left on the vine, most of them, sadly still green as anything. It always is such a pain to do pulling all the tomatoes, particularly when its usually last minute and freezing out, but it seems so wasteful to let these beautiful summer fruits just freeze on the vines. Hence, my basement is now filled with trays and trays of green tomatoes. The problem is that many of them decided to ripen simultaneously. So what does one do with a bounty of tomatoes? There are many things that you can do and I have done a lot of them, yet the tomatoes continue to ripen and beckon for someone to do something with them. This seemed the next logical step. What is absolutely amazing to me is how concentrated it becomes. I started out with 10 lbs of Roma tomatoes, which is a lot of tomatoes for this batch of paste. I then split them in half, taking out the seeds and put them in a pot. Even split and cored, these tomatoes still filled a huge pot. The tomatoes boiled down for about an hour until they were soft. I then allowed them to cool and put them into the fridge overnight, for no other reason but my own schedule which did not permit me the time necessary for the next steps. 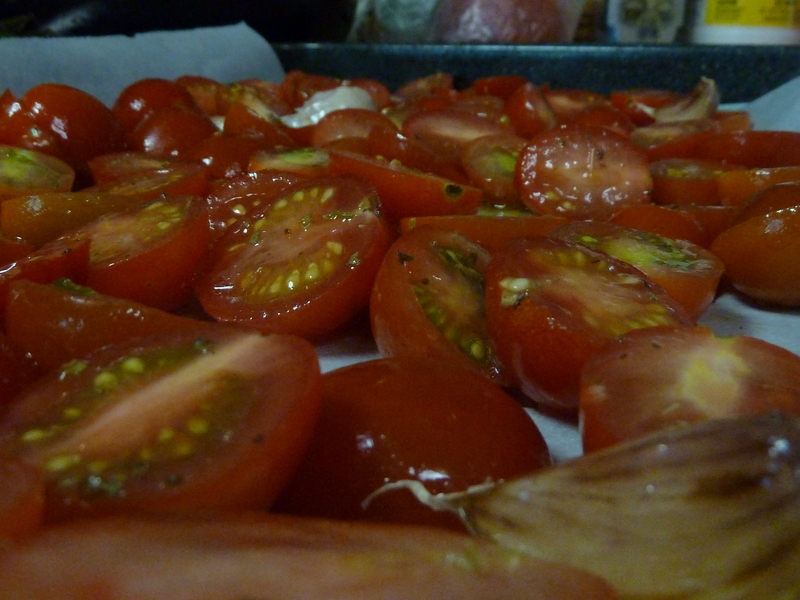 The following day, I took those tomatoes out, put them through the food mill on a fine setting to get rid of the skins. I still ended up with a sauce pot full of cooked tomatoes. I added a couple teaspoons of kosher salt and allowed this to boil down for another hour or thereabouts until it was reduced by half. This mixtures was then spread onto a silicone sheet on a baking sheet (covering the whole sheet pan) and cooked for several hours — probably about 4-5 total at 200 degrees, stirring every 1/2 hour or so to keep it from burning until it was reduced down to a thick concentrated paste. This paste amounted to two tiny little jars of paste. But these are not just ordinary jars of paste, no sir, they are tiny little jars of summer. Summer concentrated and squeezed into half pint mason jars covered with a thin layer of olive oil. They will now reside in my fridge and I will dip into them every time my cooking needs a little taste of summer. Covered with oil and refrigerated, they will last a year. Just in time to do it all again next summer. There are still a plethora of tomatoes in the garden. I have roasted a lot of them. 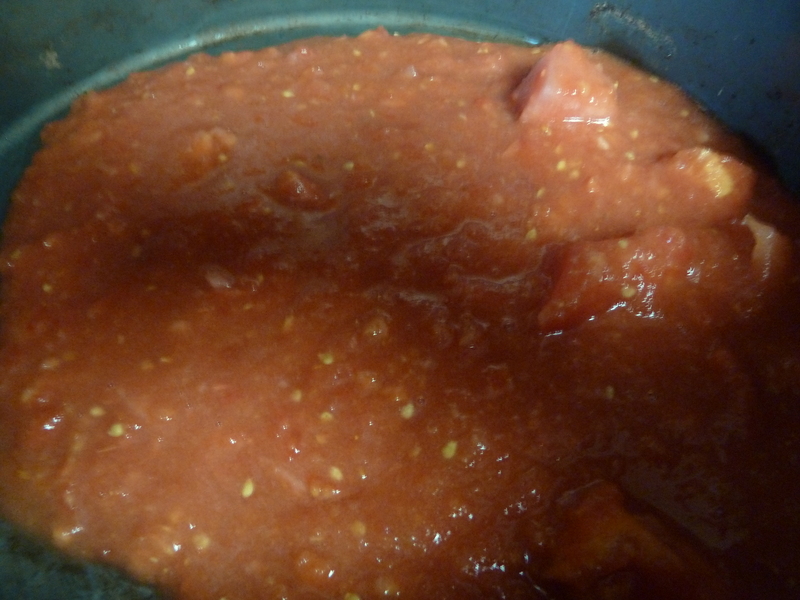 Now I am making crushed tomatoes with them that I am freezing to use later in tomato sauce, stews, soups and the like. 1. 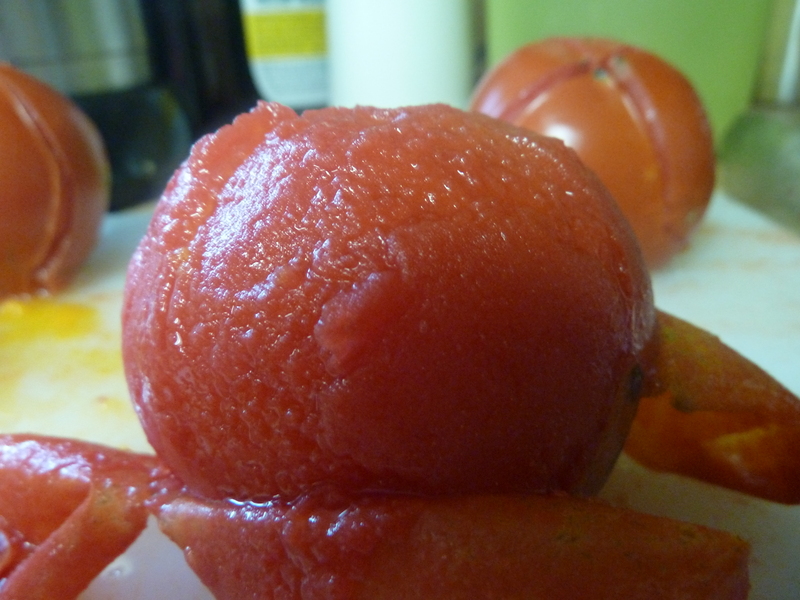 Cut an x shaped slit into the bottom of each tomato with a sharp knife. 2. 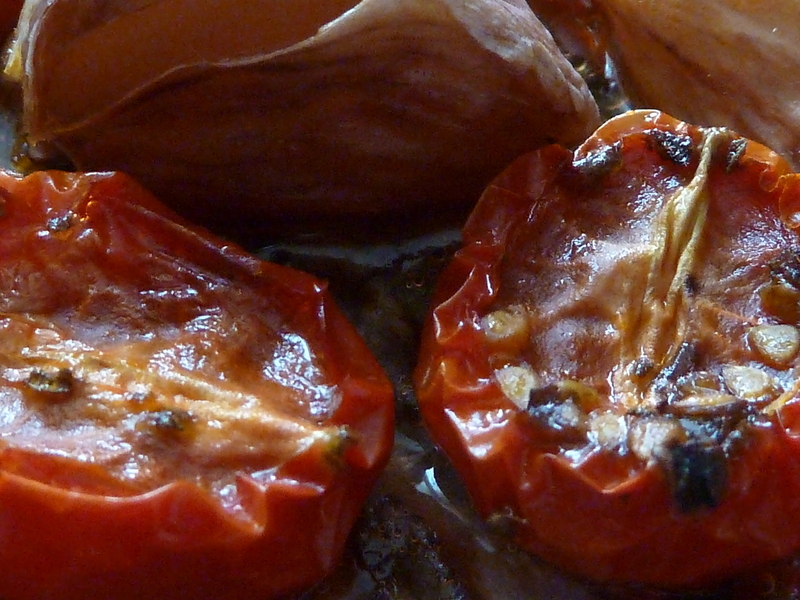 Drop the tomatoes into a pot of boiling water for 1-2 minutes. 3. Remove from water and the skins should peel off with little effort. You now have a naked tomato. 4. 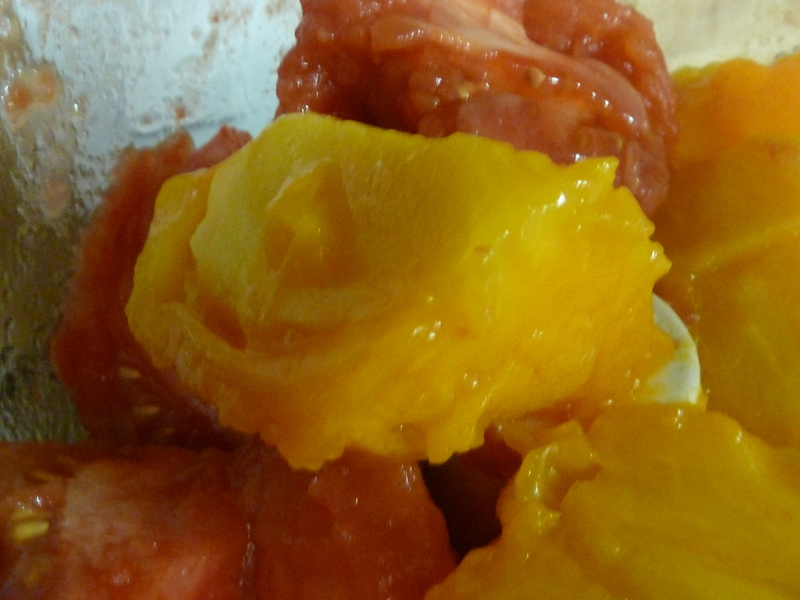 Then quarter the skinned tomatoes and place into food processor. Or put in a container to freeze. Tomatoes are everywhere. I have two bowls of tomatoes from the garden on my counter. It hardly seems that those tiny little plants that go in the ground at the beginning of summer can produce so many tomatoes, but damn if they don’t do it every time. I took a whole bowl of those cherry tomatoes that I picked the day before, washed them, cut them in half, seasoned them with a little salt, some oregano and a couple whole unpeeled garlic cloves and tossed them with some extra virgin olive oil. I put them on a parchment lined pan and into the oven. 220 degrees for about 4 hours. Oh my goodness! The house smelled delicious. 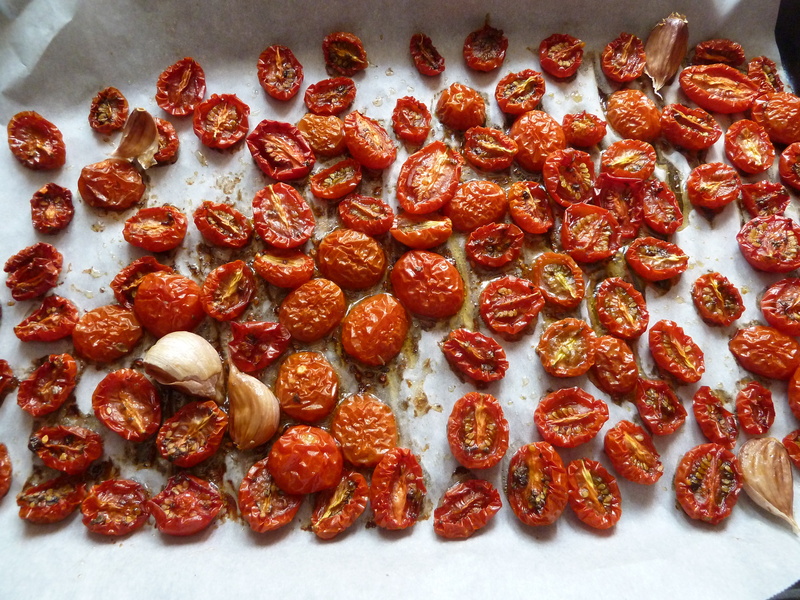 Here’s one tray down and only…..about a half dozen more to go with this last batch of picked tomatoes anyway. This batch I put into pint sized mason jars and filled them with olive oil and into the fridge they went (only after I took quite a few for last night’s pasta). I think that I will freeze the other batches in labeled ziploc bags for use at a later date. I look at the tomatoes sitting on my countertop. They are all very different from each other. Different varieties (grape, cherry, slicing, heirloom). Different colors (some green,yellow, pink and bright red). Some are from my own garden picked yesterday afternoon, some are from our local CSA picked just prior to the flood waters of Irene destroying their farm. What do they all have in common? They were all grown with love. Took some pictures in the garden this morning. Things are finally starting to take off and grow like crazy. We are harvesting small snow peas from plants on the patio, the tomatoes are doing well and the peppers are actually growing this year. Amazing. The funny thing is that the basil is not doing well, at all. Can’t figure out why, just doesn’t seem to want to grow. Anyone else having that problem or is it particular to my little piece of earth? I am not talking Buster Poindexter or The Cure lyrics – depending upon your musical taste — I’m talking the weather. Looks like summer is making a comeback and going out on Labor Day with a bang. 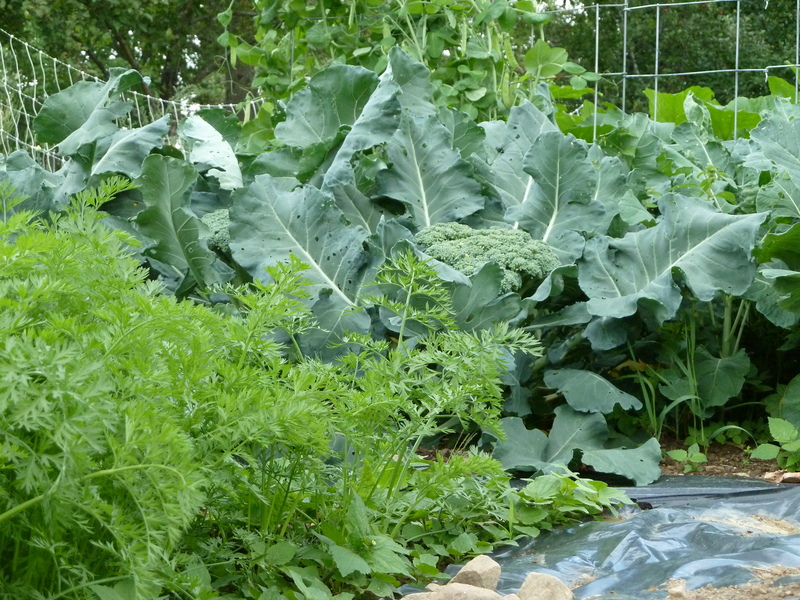 Despite getting a late start, the garden is doing great. The past few nights we’ve enjoyed fresh lettuce, cucumbers, broccoli and snow peas. 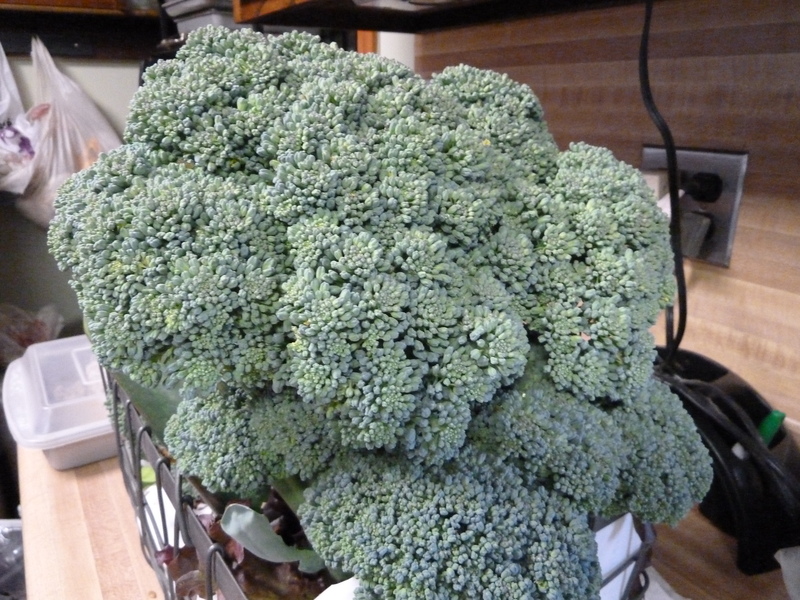 This head of broccoli measured at least 8 inches across – one head was enough for all of us for dinner. Chicken and goat poop are good for the garden evidently. So much for that fall weather – the tomatoes must have a leg up with Mother Nature. The forecast here is calling for record breaking temperatures mid week in the 90s. Add watering to the list of things to do during the week. 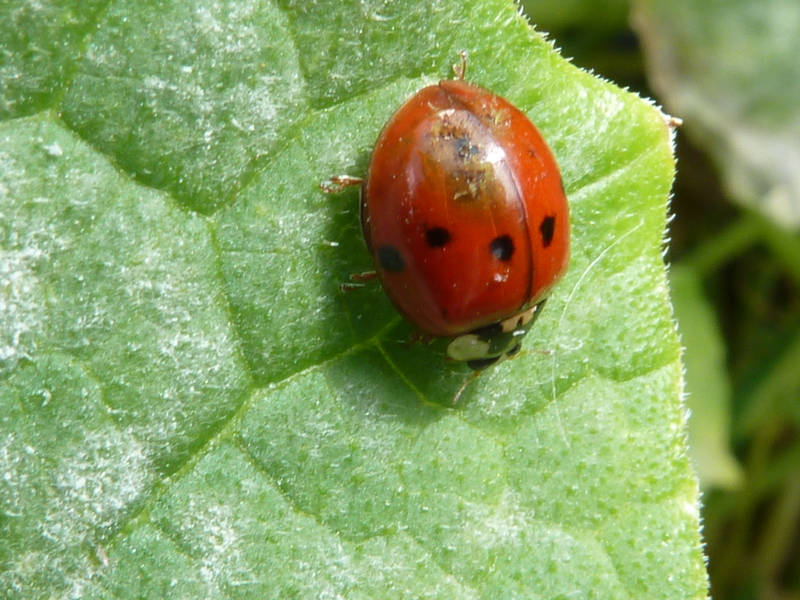 Please…..if they are going to eat my tomatoes that I worked so hard to grow then at least have the decency to eat the whole thing and not leave the evidence behind. Little thief. When I went outside this morning, it was sunny and I decided to lift the side on the greenhouse so that the bees could get in and do their work. (Yes, it has been that cool and rainy here that the plants in the greenhouse are doing much, much better than the garden and haven’t even shown any signs of it being too hot in there) When I lifted the side plastic, I saw my resident snake, curled up in my seed tray right on my plants, enjoying the warm weather. I went inside to get the camera, came out and noticed that the snake appeared to be much larger. No – the snake had morphed into 2 snakes, who were as you can see, quite comfortably lounging in my seedlings. 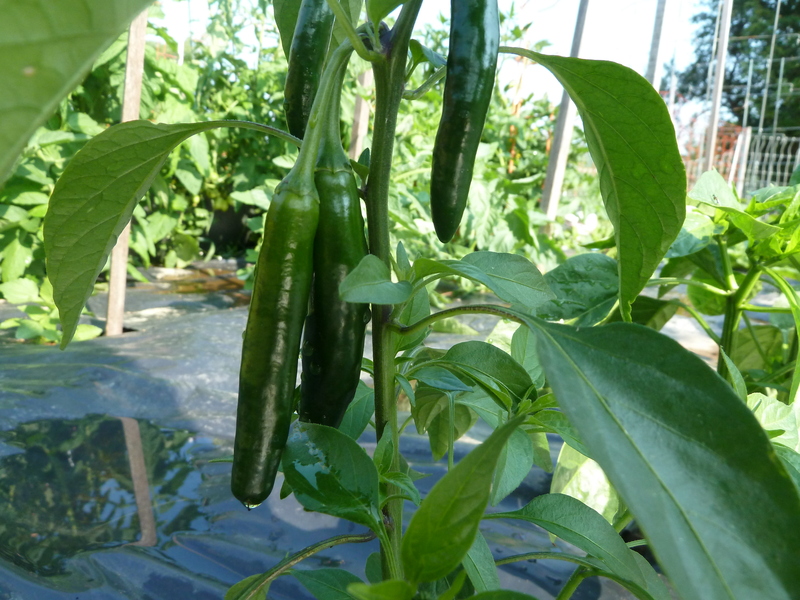 In addition to the snakes, we now have snow peas, hot peppers and little tomatoes. Finally, things in the garden are starting to bloom.